Nothing sets the tone for a visitor to a fine home quite the same as an attractive entry way with a beautiful handcrafted door as its focal point. 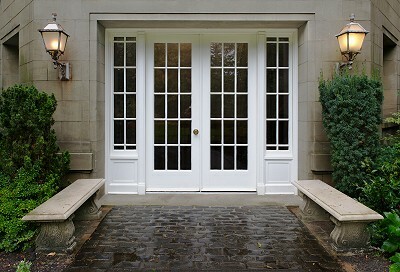 CR Doors is pleased to have supplied the front entrance system for your home. Your entry door is designed and constructed of selected hardwoods. Following proper installation, and with the right care, your door will provide many years of beauty, pleasure and security. There are steps you can take in the coming months and years to assure that you enjoy all the performance and quality built into the door by the manufacturer. First, a word about wood. Your door was once a living tree, taking moisture and nourishment from the earth and carrying them to the uppermost branches and leaves. Sap flows through the porous fiber of the wood. After the logs are cut at the sawmill, 50% to 60% of the water contained in the wood is removed through an air drying process. Finally, through a carefully controlled heated kiln process, the residual moisture level is reduced to only 8%. The water is removed through the wood pores, which remain open until properly sealed and finished. Accordingly, proper finishing and maintenance of the finish is most important. It protects the wood from reabsorbing moisture, or further drying which causes cracking and hairline splits. It's best to compare your door to a fine piece of furniture which does require frequent dusting and, after a period of time, a new finish. Sunlight is an enemy of dry wood, since heat and ultraviolet light cause gradual wood deterioration. For this reason penetrating stains, sealers, and ultraviolet resistant exterior finish must be applied to protect the wood against the elements, as well as to bring out the natural beauty of wood grain. CR Doors does not warrant performances of any finishes or finish materials applied by others. The following suggestions are offered as a guide to your selection and use of finish materials. However, we highly recommend you consult with your painting contractor or local dealer. They know what over the counter materials should give optimum performance within your environment. Plan ahead. If this is your first experience with a particular finish or stain, you may wish to test it on a piece of lumber. It is important that you be ready to finish your door IMMEDIATELY after hanging. Unfinished wood products should never be exposed to wet or damp conditions. The door must be sealed and finished within 24 hours of installation with a suitable sealer and a minimum of three coats of finish on all six sides to maintain the warranty status. Upon delivery of the door, and before fitting and cutting, inspect the door for damage and defects. Do not hang door with any noticeable damage or defects. Store and install the door in a dry area, and avoid exposure to direct sunlight. Avoid prolonged exposure to heated or air-conditioned environments prior to finishing. Prior to staining, the product should be clean and free of dust. Use a fine grit (220) sandpaper or #00 steel wool to remove ANY finger smudges, marks, etc. All weather-stripping and hardware should be removed prior to finishing so finish may completely cover product. If clear coating is to be used in the finishing of the door, it will be necessary to match the color of putty for nail hole fillers on the raised molding of the door. The filler should contain wood pulp to absorb the clear coating to blend with the door. After the stain has been allowed to dry, apply AT LEAST 2 coats of a clear EXTERIOR moisture sealer. Solvent borne sealers are excellent. Second coat to be solvent borne (oil base). It is suggested Spar or Marine Urethane. AVOID POLYURETHANE because it tends to breakdown with UV rays causing the door to receive direct exposure to the elements. Remember that the sealer is not the finish. Its purpose is to seal the wood pores as a highly penetrating, low viscosity material. Lightly steel wool or sand after each coat of clear sealer is applied. Pay particular attention to the bottom edge which may become exposed to water that may collect on the threshold or under the sweep. Your door can literally sit in a puddle of water with some types of door sweeps. Apply at least 2 coats of a high quality EXTERIOR grade, fade-resistant, ultraviolet inhibiting Spar Urethane or Marine Varnish. Sand lightly between coats. BE SURE TO SEAL ALL 6 SIDES OF THE DOOR, AS WELL AS ALL HARDWARE PREPS (HINGES, LOCKS, FLUSH BOLTS AND ASTRAGALS). It is recommended to apply as many coats of finish to the top and bottom of the door as are applied to the other surfaces. This will lengthen the life of your door. Spar varnishes are suitable, though they are softer and darken slowly on exposure to sunlight. DO NOT USE LACQUERS. It is not recommended that you use waxes over an exterior finish. Depending upon the degree of direct sun exposure or the climatic conditions of the area, it may be necessary to apply additional coats of finish from time to time. Waxes make it difficult to overcoat without first completely removing the wax. Some polishes also have a tendency to penetrate and soften the finish. However, Lemon Pledge has been found suitable. Be sure to remove all excess polish and wipe dry. TO DATE, THERE ARE NO EXTERIOR WATER BASE FINISHES WE CAN RECOMMEND THAT WILL ADEQUATELY PROTECT THE DOOR FROM THE ELEMENTS. Periodic maintenance may be required by the end-user and is not part of the warranty. Such maintenance may be required at any time and may include, but is not limited to, maintaining the exterior finish and trimming swollen wood products. The required maintenance may vary depending upon environmental conditions in the area and overhang protection provided. Stain and clear finishes perform better if protected from sunlight and weathering. (Re-finishing will be required less frequently). Exterior door finishes may deteriorate with exposure to environment. Inspect finish at least once a year. Refinish as needed. High temperature (due to direct sunlight) develops in the space created by using a storm door. This excessive heat can cause panels to split.